Note: This post will remain at the top of my blog until the Clean-Out! is completed on the 15th - so be sure to scroll down and read the other posts going up in the meantime! MckLinky is set to close on the 15th also. 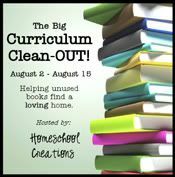 If you would like to join in on the Curriculum Clean-Out! and have fun giving away the excess on your shelves, now is the time! Once your post is ready, leave your link below using the MckLinky. Please be sure that your post follows the 'rules' of the Clean-Out! ~ please be sure to link your post back to this giveaway page and that you are using the permalink for your post. If you have any questions, I would be happy to help you out. Giveaways will be added daily, so be sure to check back so that you don't miss any of the great giveaways! Spread the word, make some new friends and have fun!! The big thing to remember - grab the code below, put it somewhere in your post, link back here, and start giving!! I'm getting my post ready today and will have it linked up by tomorrow! Hi! I am putting a giveaway up on the Mr. Linky, but I CANNOT figure out how to put that button on my post! Can you help? I went ahead and linked back to you, so I am going to go ahead and post it, but I need help with the button. Thanks! I can't wait to link up tomorrow! There are some great giveaways already! I would love to join in but I am following your blog from NZ and my son is too little still. Thanks for an amazing site and being an inspiration! What's in My Homeschool Planner?